As the piece to earn the affections and desires of everyone, this luxurious statement ring from Vera Wang features a total of 2.45ct of glittering diamonds that surround the piece on almost every section. The large centre stone sits at the top with incredible sparkle and is only embellished further by pavé set diamonds that sit on the shoulders and on the shank that create an incredible glittering texture when viewed from above. As a piece designed for those with the most opulent of tastes, the signature blue sapphire sits underneath the centre stone marking it as an authentic Vera Wang ring. Personally approved by Vera herself, you can enjoy the assurance of having a ring that was created with years of experience in high fashion. Vera Wang 18ct White Gold 2.45ct Diamond Cushion Halo Ring is rated 5.0 out of 5 by 3. 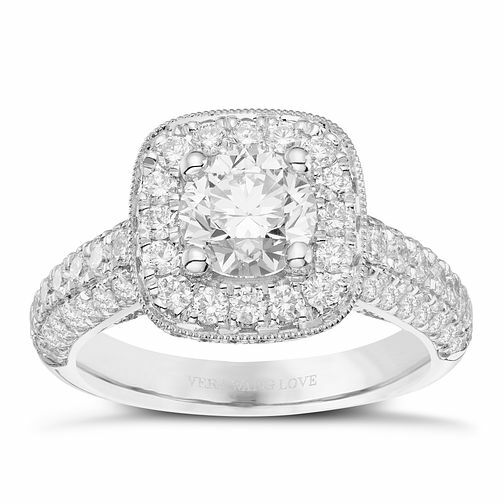 Rated 5 out of 5 by Anonymous from Vera Wang 2.0ct Engagement ring Absolutely perfect. Every single person who sees it is blown away. Looks beautiful with the diamonds around the edges and the sapphires underneath. Easy to buy a normal wedding band and have it flush against the engagement ring as the main stone sits quite high. Absolutely no downsides to this ring. The 1.7ct version looks pretty much the same but I opted for the slightly bigger 2.0ct version due to the fact that it has a full carat centre stone.